Porcelain bathroom fixtures are a classic choice and can work with almost any decorating style. They are popular because they are inexpensive and easy to clean. Most bathroom fixtures-sinks, toilets and bathtubs-are available in porcelain, which is a ceramic material. While many people think of porcelain as white, it is available in many colors depending on the manufacturer. Porcelain fixtures can look minimal and modern or include ornate detailing for a traditional look. Vintage porcelain fixtures are also popular additions to new bathroom renovations. Pedestal sinks: Pedestal or freestanding sinks are self-supporting. They are an elegant option and work especially well in small bathrooms; however, they decrease storage space due to the absence of a vanity. While porcelain pedestal sinks often look very traditional, they are available in modern designs as well. Under mount sinks: This type of sink is set into the vanity counter top. Sometimes the porcelain lip of the sink is visible, and in other cases, the counter material covers the edge of the sink for a clean look. Vessel sinks: A popular option, vessel sinks are set on the surface of the bathroom counter like a large bowl. The sink appears like a sculpture and can come in a variety of porcelain finishes and shapes. Tank toilet: The most common type of toilet is made in two pieces: the bowl and the tank. One piece toilet: For a cleaner look, this porcelain toilet is cast in one piece. Tankless toilet: By eliminating the tank, the toilet is a smaller fixture. Wall mounted toilet: This toilet is lifted off the ground, making it easier to clean beneath. It is popular in modern designs. Bidet: While more common in Europe and other countries than in the US, bidets are commonly made in porcelain and can be purchased as a match to your toilet design. Freestanding tubs: Antique porcelain clawfoot tubs are the most well known, but there are also freestanding porcelain tubs that have modern metal legs or sit directly on the surface of the bathroom floor. Drop in tubs: The most common type of bathtub, drop in tubs are built into a frame that is then covered by tile. 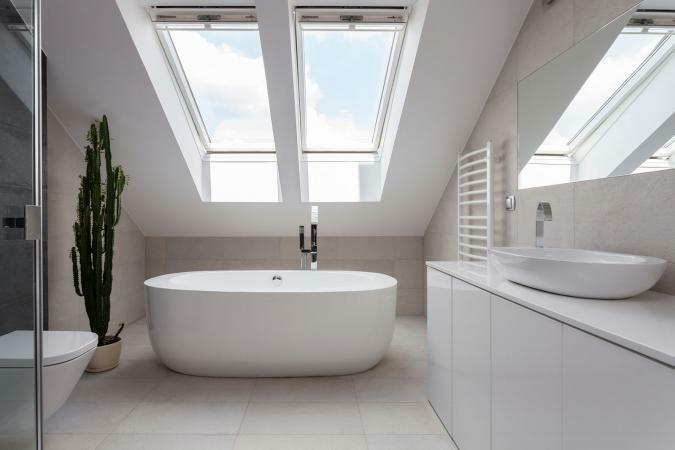 Only the porcelain interior of the tub is visible. While porcelain is a relatively durable material, take extra care when assembling or installing these fixtures to prevent chipping or scratches. Always read manufacturer's instructions and warranties before proceeding with installation, and when in doubt, hire a licensed plumbing contractor.If you decide to install the fixtures yourself, the first and most important step is to turn the water supply off at the nearest shut-off valve. Excess water will likely drain from the line after it is unhooked, so use a small bucket or empty pot to catch it.